January 22, 2018 / Astoria Neighborhood / Queens Community Issues / Queens Buzz NYC. A week ago I headed over to the Redken Saloon Salon in Astoria for the 7th annual Save the Stache fundraiser. I had attended the event last year, watching quite a number of local celebrities for a day, shave their beards and mustaches in order to raise funds for QSAC which is the acronym for Quality Services for the Autism Community. Quality Services for the Autism Community [aka QSAC] has programs designed to help families enable their children to do more for themselves as well as the community. QSAC offers emergency fund assistance for unexpected crises as well as reimbursement options for some of the things not covered by other government / private / social programs. The organization also provides respite services in the home as well as overnight stays away from home, to provide a bit of a break to the caregivers. And QSAC helps families find and coordinate services to help children with autism, as well as providing offsite “home environments that foster independence, community integration, individualization and productivity”. 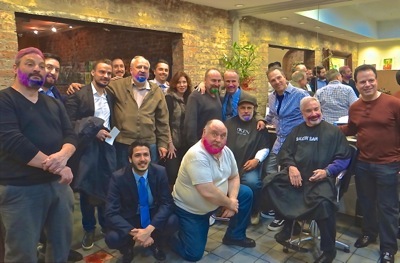 CLICK here to view the video of the colorful, whisker-freeing fundraising event Save the Stache by QSAC at the Redken Saloon Hair Salon in Astoria. January 10, 2017 / Astoria Neighborhood / Queens Neighborhoods / Queens Buzz. It was the first weekend night of the New Year, which after the relaxing holidays generally tends to be fairly low key. The streets were quiet on a clear, cold January evening as I made my way up 30th Avenue toward Steinway Street. I didn’t really know what to expect at the Shave the Stache benefit at the Redken Saloon Salon, where the event has been hosted for the past five years. Unlike the silent streets, the Redken Saloon Salon was bustling with life when I arrived. I was warmly greeted by members of the Quality Services for Autism Community [aka QSAC], as I made my way into the salon. One of the first people I met was William Balash. He’s a big man, who at the time, was sporting a hearty crop of whiskers, which he told me he’d been growing since October. He introduced me to Patricio Barrientos, External Affairs Coordinator of QSAC, who provided me with a bit of background information about the group, including that it was founded in 1978 by Queens parents of children with autism who were searching for more productive ways to raise autistic children, than were currently available at the time. Today QSAC serves 2,100 people with autism in NYC and on Long Island. In the photo at right are the men who had their whiskers shaved, alongside those who shaved them. Back row from left to right are: Mike Christoforotos, Spiro Aganastopoulous, Janos Kanta, Nicholas Halvatzis, Jerry Crisafis, Joe Vaccaro, Sofia [hair stylist], Ken Marzocco, and Paul Halvatzis. The two men kneeling are Nicholas Zikos and Bill Balash, while the two men seated are Steve Sirgiovanni and Larry Litwack, with Redken Saloon Salon owner Frank Arcabascio standing between them. Last, but not least, is Jim Halvatzis standing far right. William and Patricio introduced me to Katrizyna [aka Katrina] Kozena, of Art for Healing NYC. Katrina told me that the group was founded circa 2001 and gets artists to donate works which are auctioned off at fundraising benefits to help those in need. The proceeds from the auctioned art are shared by both non-profits and the artist receives free publicity. Art for Healing doesn’t provide art therapy, which oftentimes includes interpretation of artworks after they’ve been completed; but rather Art 4 Healing uses art as a means of enabling people to emotionally connect with themselves in ways that may not be available in daily life. Katrina showed me the work being auctioned off this evening, which was a wood painting by a Latin American artist. The artist’s name is Angelo Romano who currently lives and works in NYC, but is a Spanish artist immigrant from Latin America. 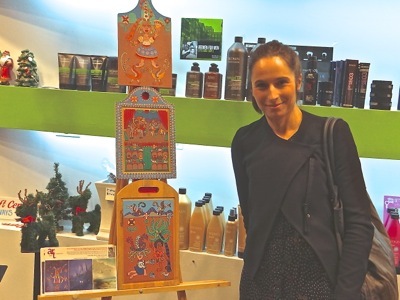 The work was a hand painted wooden totem pole – acrylic on wood. In the photo at right is Katrizyna Kozena of Art4Healing.org. Click here a bit later today for the rest of the story including more photos and video about Shave the Stache benefit for QSAC in NYC. October 30, 2016 / Astoria Neighborhood / Holidays in Astoria Queens / Queens Buzz. It was ghoulish, it was hairy and in fact it was just plain, downright SCARY. There’s just no other way to describe the Astoria Family Halloween Parade. 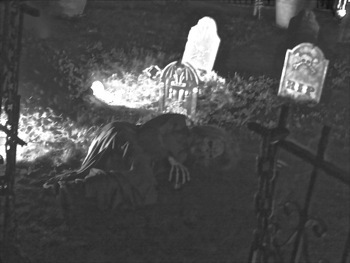 There were ghosts, goblins, witches, monsters and people back from the dead. They came by the hundreds and in all sizes. They were tall, small and everything in between. 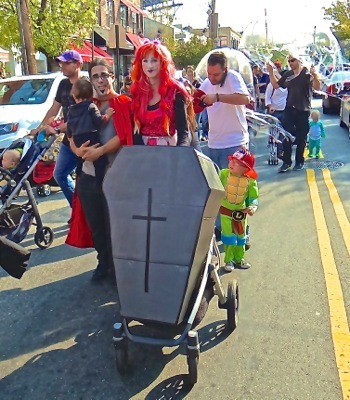 There were likely over one thousand people who came to participate in the tenth annual Astoria Family Halloween Parade. Yet, even though I was surrounded by all of these frightening monsters, I felt a certain calm. Why? Why so calm amidst all of this horror? Because there were possibly even more superheroes in the crowd. Wonder Woman, Superman, Batwoman, Batman and how about those Ninja Turtles? The ghouls, goblins and their parents congregated at Ditmars & 31st Street beginning at 11.30 am filling all four corners and then some with plenty of people decked out in full Halloween garb. The weather was amply cooperative climbing well into the 70’s and I heard some of the monsters complain that they were overheating … but not the devils … they seemed to feel right at home – if not a bit chilly. The police cordoned off one lane of Ditmars between 31st Street and Astoria Park and at noon, the families packed up and marched down to Astoria Park along the East River. The families came streaming down the Great Lawn and started taking their places on the grass in front of the stage erected by the Central Astoria Local Development Corporation also known as CALDC. CALDC had organized a Halloween event, which they called the First Annual Batty Over Halloween Celebration. The free event included face painting, balloon twisting, a children's Halloween sing along, cotton candy and munchkin pumpkins giveaway. All in all it made for a fun outing for the kids and parents of the neighborhood who embraced both the parade and the Halloween after party. The parade was started around 2006 and continues to be organized by the Astoria Moms Meetup Group and Queens Mamas. 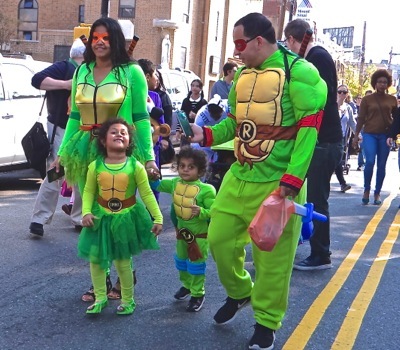 Click here to view the Astoria Family Halloween Parade 2016 slide show. May 31, 2016 / Astoria Neighborhood / Ethnic Culture in Queens / Queens Buzz. On Saturday May 21st from 1.30 until past 6 pm, there was a series of cultural performances held on the Great Lawn of Astoria Park. The event was hosted by the Central Astoria Local Development Coalition [CALDC] to showcase the multi-ethnicity of tne neighborhood. Nearly a dozen local cultural groups performed, including Ballet Los Pampas representing Argentina, KUD Halaturko representing Bosnia, Croatian Franciscan Fathers Youth Club, Ayazamana Cultural Center representing Ecuador, Cretan Association representing Greece, NYC Bhangra representing India, McManus School of Irish Dance, The Braata Folk Singers representing the Caribbean / Jamaica, and the Korean Traditional Music and Dance Center. There was a crowd that numbered in the hundreds over the course of the afternoon. Many brought lawn chairs and blankets to sit upon while they watched the show. The weather cooperated as the temperature was in the 60's and while at times cloudy, it was dry. Several food vendors came out to augment the cultural celebration, now in its second year. As I came late in the afternoon, I had missed the prime time of that part of the event. In the photo at right you can see one of the performers walking up the Astoria Park Great Lawn after her performance. 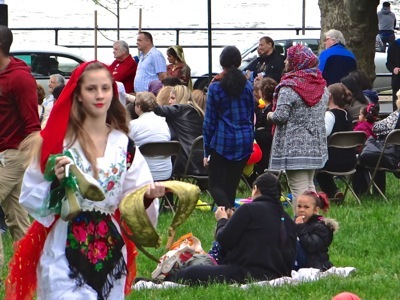 Click here for a brief video of some of the 2016 International Culture Festival in Astoria Park. November 23, 2015 / Astoria Neighborhood / Modern Dance in Queens / Queens Buzz. I just returned from one of the most exciting dance performances I’ve seen in a long, long while. The dances were performed at the Frank Sinatra School of the Arts in Astoria on Saturday night. Unfortunately, DanceWorks performances may only be seen twice a year and the next one isn't until May 21st 2016 at this same location. The show opened with a short introduction by DanceWorks Founder Lisa Mara, and DanceWorks New York City Director Jackie Arcy. Their introduction was followed by a dance video. And then the show began. The show presented about two dozen original works and literally included a cast of about 140 dancers and choreographers. All of the dancers and choreographers had auditioned to participate in the show and then practiced and rehearsed for 16 straight weeks. The show lasted two hours, but the time flew by. The photo above shows one of the dance performances at DanceWorks New York City at the Frank Sinatra School of the Arts. Click here to read the rest of our report about the semi-annual performance entitled DanceWorks New York City NYC at the Frank Sinatra School of the Arts in Astoria. 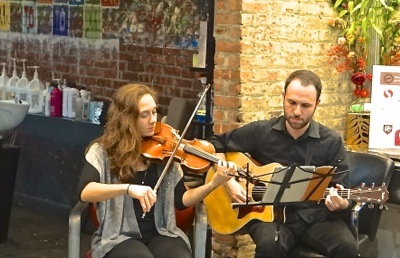 January 19, 2015 / Dutch Kills LIC / Art Exhibits in Queens / Queens Buzz. It’s not often one gets to see a bit of history in the making. But last Saturday evening I made my way to the QNS Collective in Astoria / LIC to see a bit of it. 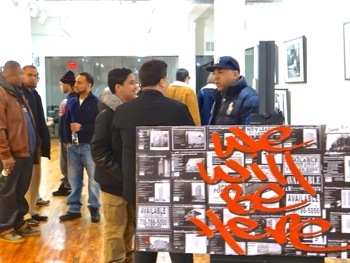 The event was the opening reception of We Will Be Here, a photographic exhibit by Salvador Espinoza about the changes taking place in the Dutch Kills neighborhood of Long Island City. The exhibit included 13 framed photos hanging on the walls of the second floor of the QNS Collective, a modern new office space in Astoria / LIC. Another twelve will be rotated into the exhibit during the course of its showing which runs through February 6th. The photos are a recent look at the changes taking place in the Dutch Kills neighborhood. The photos were shot in black and white over the past year, and provide a personal glimpse of the development of the Dutch Kills neighborhood by someone who grew up in it and has spent the better part of his life living there. The photo above shows Salvador standing in front of one of his photos where his brother held up a photo of a vista one would previously encounter while standing at the Queensboro Plaza subway station, which is now hidden behind a number of shiny new highrises. Salvador told me that he moved out of the neighborhood for a few years [to Sunnyside] and he frequently returned to visit family and friends. He started noticing significant changes to the neighborhood occurring between each visit. He thought that someone should start recording the changes, because the neighborhood he grew up in, would soon vanish into the past. After giving the idea some thought, he concluded that perhaps he was the one to do it. So he reached out to the Queens Council on the Arts and they provided him with a small grant to pursue the project. Many years ago Salvador had been an amateur photographer, and when he took up this project, he began anew. Over the course of the past year he started taking photos of the neighborhood including some of the everyday houses that likely will soon be demolished and replaced by apartment buildings, as the value of Dutch Kills real estate h as skyrocketed in recent years. Some of his photos include his neighborhood friends. I met Chris of EQ Lyrics, who is included in one of the photos of the exhibit. Chris had just completed a music video and tonight - as part of the exhibit opening - we were to witness the first public showing of Chris’s music video. Salvador directed it and Chris plays the leading male role. The lights dimmed, the crowd gathered around in a sort of amphitheater configuration, and the video began. The video is shot entirely in the LIC / Dutch Kills / Astoria neighborhood. The video is called A Beautiful Day which Chris told me was about, "getting drunk and banging chicks in the city" [a photo still from the video is to your right]. We've embedded the video at the end of this story. 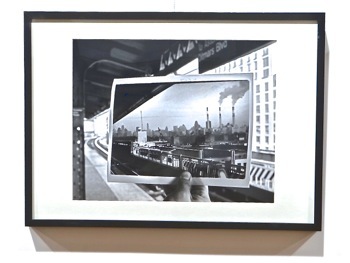 Click here to read the rest of our story about the photo exhibit We Will Still Be Here, about the changing face of Dutch Kills real estate, at the QNS Collective through February 6. October 19, 2014 / Astoria Neighborhood / Queens Culture / Queens Buzz. It’s not often one stumbles upon a legend and then finds himself riddled in its mysteries. But so it was last Saturday evening, while biking through Astoria Park that I encountered an older gentleman who called to me asking for help. It was near dusk as the sun began setting behind the skyline and the shadows grew longer. 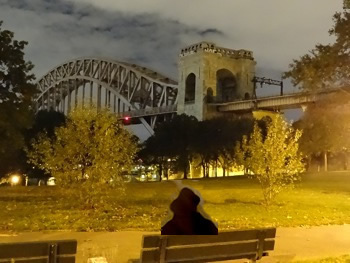 He was sitting on a park bench overlooking the Hell Gate Bridge and dressed in clothing of years gone by. He had not shaved in several days and his hair was a bit disheveled. I sized him up as I approached and determined that he was probably ok.
“Hi. What’s up?” I asked. “I need help.” He replied. I looked at him inquisitively as he didn’t appear to be in any immediate predicament, near as I could tell. “I see by your bag that you work for a [web] magazine. Are you a reporter?” I nodded affirmatively. He pulled some photos from his coat and handed them to me. I started thumbing through them, seeing what seemed to be photos of ghosts flying through the Astoria neighborhood. The photos weren’t that clear and mostly in black and white. I didn’t really know what to make of them. “I heard you the first time, but I don’t understand what you mean.” I replied. Click here to read the rest of the story about the Legend Of Hell Gate Horror. The following is a list of the NYS Health Insurance Navigators as of November 12, 2013. You can also find these on the NYS Health Insurance website. 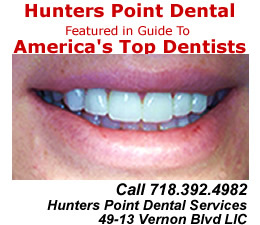 Click here to review a summary report outlining the many aspects of the Affordable Healthcare Act / Obamacare in Queens. And click here for a list of NYS Health Insurance Exchange Navigators. May 5, 2013 / Long Island City & Astoria / Biking Queens / Queens Buzz. 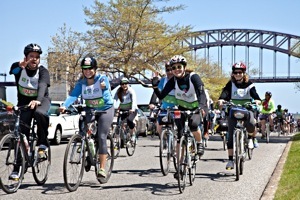 This Sunday some 32,000 bicyclists rode through Astoria and LIC on their way to completing a 40 mile bike ride through all five boroughs of NYC. Photographer Abdel Berrera caught up with them at the Astoria Park rest station where many took a moment to catch their breath. 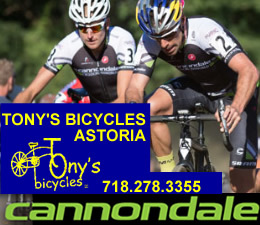 Click here to read a brief report and to see a photo slide show of the 5 Boro Bike Ride in Queens shot by Astoria photographer Abdel Berraha. March 19, 2013 / Astoria Neighborhood / Queens Schools / Queens Buzz. Editorial / Report. We attended a Community Board One Meeting Tuesday evening, following up on the concerns of Astoria parents, regarding the proposed changes to PS 122, which were recently announced by the Department of Education [DOE]. 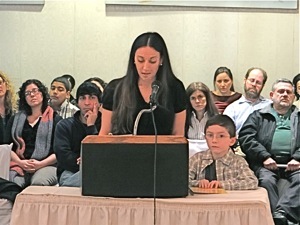 Click here to read the rest of our Editorial / Report on the Community Board One Meeting regarding Department of Education proposed changes to PS 122 Astoria. Story & photos by Michael Wood. Astoria Neighborhood / Queens Buzz. Astoria has some of the finest shopping areas in Queens, including Steinway Street, Broadway and the Ditmars Blvd and 31st Street areas. This section contains maps, a shopping center that links to many advertiser home pages and stories about what you'll find in some of Astoria's unique stores. 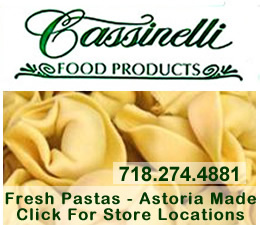 Click here to enter the Astoria Shops and Shopping section of the site. 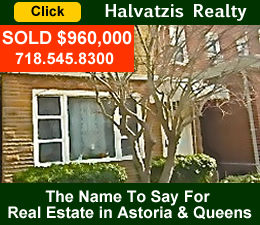 Astoria Real Estate / Queens Real Estate / Queens Buzz. This is the Astoria Real Estate section of the site. 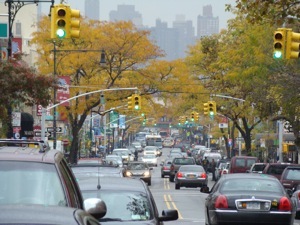 Click here to view reports about business and real estate in Astoria Queens. 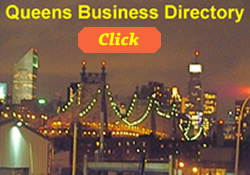 Click on the icon below to view business directory for Astoria & Queens. 1. 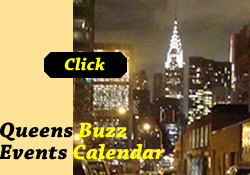 Click the icon to your left to view the Queens Events Calendar. 2. To submit an event to the member calendar set up a member ID in the COMMUNITY section of the site along the left side bar. Then click into the Member Calendar link in the same section to post the event. To start posting a member event you must first click the drop down arrow to select the member calendar. Event postings are FREE to community organizations, arts groups and non-profits. 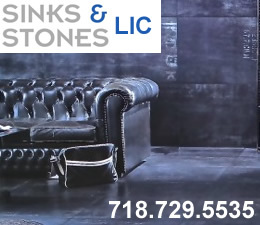 Click this link to search for something in our Queens Business Directory containing over 1,000 listings. 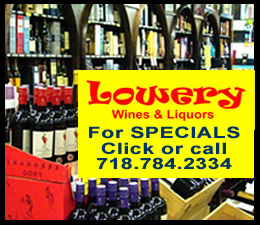 Click here for one of the leading places to buy funeral flowers in astoria. 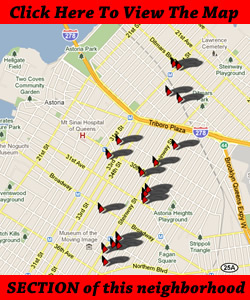 Or click here to find one of the leading realtors in Astoria. Click here for one of the leading sellers of Hunter Douglas blinds in Astoria. 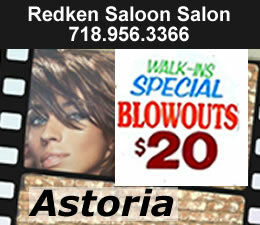 Click here to view the home page of one of the leading hair salons in Astoria.